Robert J. Donia is a leading historian of Bosnia & Herzegovina (Islam under the Double Eagle: The Muslims of Bosnia-Herzegovina 1878­1914 ; Bosnia & Hercegovina: A Tradition Betrayed [with John Fine, 1994], Sarajevo: A Biography ) and was a frequent expert witness for the Office of the Prosecutor in the International Criminal Tribunal for the Former Yugoslavia (ICTY). Robert M. Hayden is an anthropologist and lawyer who has written much about political, legal, constitutional and social issues in the former Yugoslavia (Blueprints for a House Divided: The Constitutional Logic of the Yugoslav Conflicts , From Yugoslavia to the Western Balkans: Studies of a European Disunion ) and was the first expert witness for the defense in the ICTY. 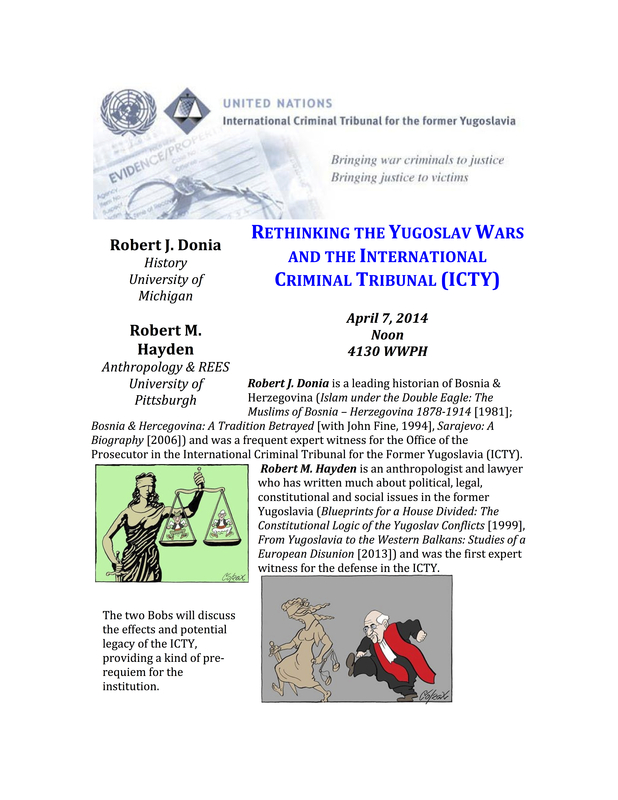 The two Bobs will discuss the effects and potential legacy of the ICTY, providing a kind of pre-requiem for the institution.